It’s all connected how the fight for gender equality is linked to other movements. 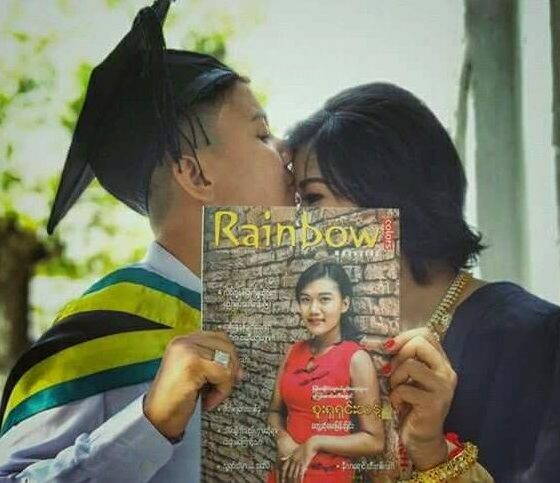 Since 2008, Colors Rainbow published Rainbow magazines with the purpose of making the awareness of LGBT movements and anti-discrimination base on sexual orientation, gender identity and gender expression. The purpose of publishing Rainbow magazine is not only making the awareness LGBT rights movements in international and domestic, but also arising sympathetic sense among non-LGBT peoples by bridging human senses of LGBT like others. Rainbow magazines are being published as the printed magazine and online magazine. 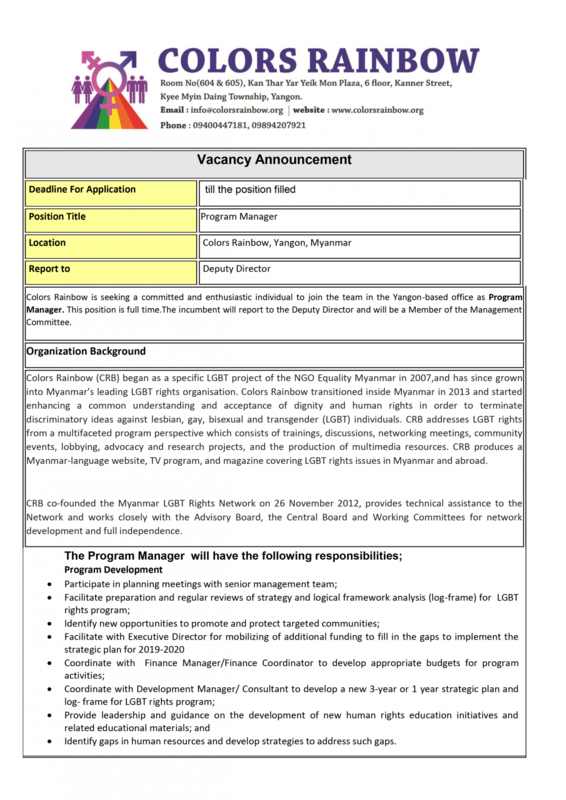 The printed magazines are the bi-monthly publication a year, with the free distribution around the country in the collaboration with LGBT Rights Network (Myanmar), The Network covers 13 areas (regions) in Myanmar. 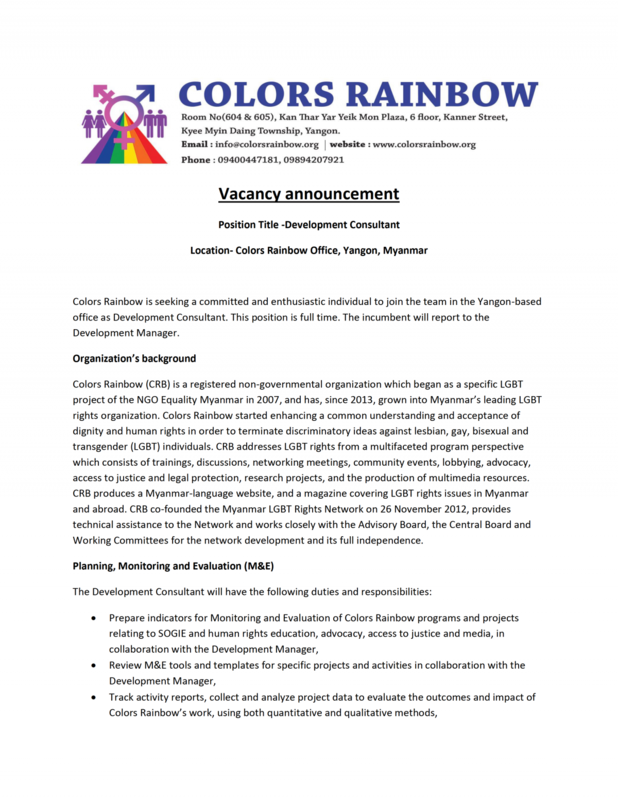 Online magazines are uploaded on both of facebook and www.colorsrainbow.com, published separately with the aims of being accessible via internet for who are not ready to read magazines in public and who are in remote areas which are out of the coverage areas of LGBT Rights network. Legal section in which it purposes to give the service of providing the legal knowledge to readers regardless of being LGBT and Non-LGBT. Entertainment (LGBT related Movies Reviews) section. And also, www.colorsrainbow.com was aired in which updated news, articles and interviews are being uploaded. Apart from the Rainbow magazines production, Media program of Colors Rainbow is taking into part the production of LGBT related books and booklets including pamphlet with the purpose of utilizing IEC materials for raising awareness about SOGIE and LGBT rights among people regardless of being LGBT and Non-LGBT people. All products such as Rainbow magazines (Print and Online), IEC materials used books, booklets and pamphlets including reports have been showcased at the portfolio section, but just samples. Colors Rainbow started to produce LGBT documentary films and short films since 2014. With the collaboration of &PROUD, Colors Rainbow also established the Rainbow Reels. And also, the documentary films making workshops were conducted for the members of Rainbow Reels. Documentary films produced in the films making workshops, were submitted to local and international films festivals. In 2017, two documentary films won prizes at the Watthann films Festival, a local well-known film festival in Myanmar, as the best documentary film award and audience award. In 2018 as well, one documentary was selected in the film competition list of Watthann films festival, in along with one film selected to screen at the non-competition list at its’ films festival. Some films were also utilized in training and workshops as teaching tools and screened as well in workshops, workshops and meetings conducted with special persons, such as parliamentarians, government staffs, members of law and enforcement body, and teachers etc, as advocacy tools with the purpose of being the awareness raising about LGBT issue. Some documentary films and films can be accessed at vimeo account except to some films owing to having a plan to submit in international films festivals. 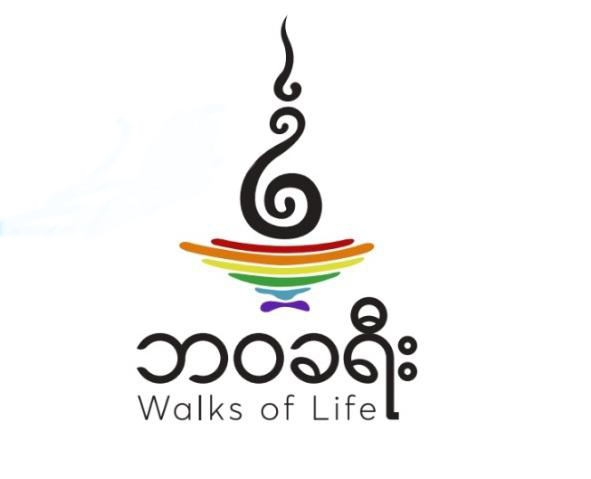 Walks of Life is a project being run by Media Program of Colors Rainbow. 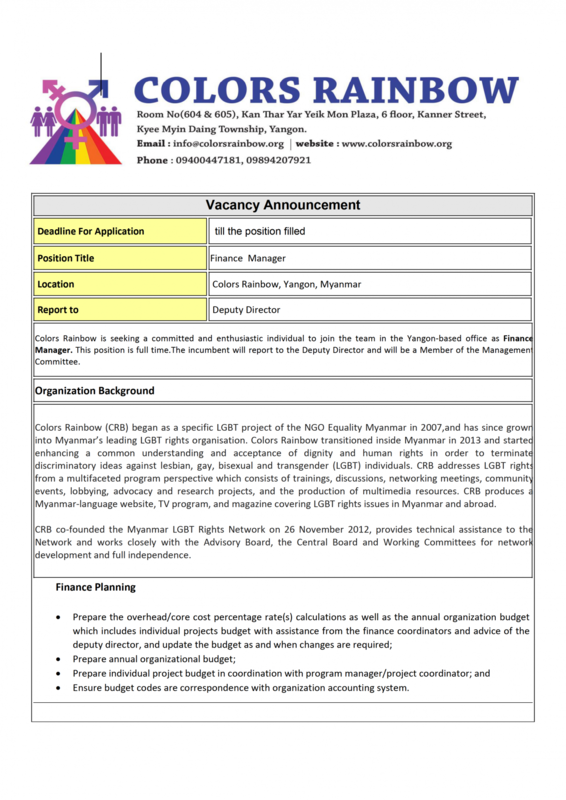 It has been started in Yangon since 2016 with the support of Swedish Institute and the Straight Museum. There were total of 120 interviews from 6 cities in Myanmar including Yangon, Mandalay, Maw LA Myaing, Tang pyone, and Larshio. Narrators often exhibited pride in who they are, no matter how much violence, prejudice, and discrimination they survive. They told stories with immense complexity. Stories show a reality is many people who do not express their gender or love according to social and cultural expectations are mistreated and are said to oppose nature. There is not much room for these marginalized groups to voice their needs and challenge the supposed natural-ness/normality of these constraining norms. The discrimination comes in many forms, including portrayals in institutions like museums that reinforce prescribed behaviors, and ignore the diverse and rich history of many minority communities, including the LGBT communities. By making this collection, the project hopes to assist the development of understanding and tolerance and serves as a historical documentation for the community to learn about ourselves. Through learning about our history, we can circumvent a great deal of time that would otherwise fall to self-destruction and self-questioning over whether or not we are normal. We can in turn place more immediate focus on liberation and fulfilment.